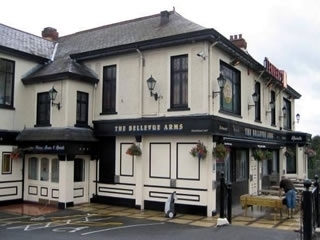 The Bellevue Arms is situated on the Antrim Road in Newtownabbey near Belfast Zoo. Its dominant position overlooking Belfast and beyond makes it one of North Belfast's most famous Bars and Restaurants. Have you got Google Earth on your computer? If so, then download the Google Earth view of Bellevue Arms. Is this the wrong position for Bellevue Arms? If you think so, then modify its position. Click / Tap the button above to get directions from where you are to Bellevue Arms. Called in to the restaurant for dinner on Monday evening as it was near to where I was staying. I wondered why it was called the Belle Vue, I soon found out, what an amazing vista of Belfast Lough and city from the windows! The food was very good, fresh veg, not frozen and at a very reasonable cost. All the staff were attentive and helpful and the service was quick. old fashioned bar, very busy with locals. 2 guys on next table had burger and chips and we were amazed at the size of the massive burgers, but the men cleared their plates in good time so i"m sure they enjoyed them.We will be back !!!!. Some people are very hard to please, the food is very good at a great price,(check out the daily specials) if you can get the same value for money in belfast take it. Went with my sister and her friend from Austraila and they both loved it. Ate up in the restuarant and wasnt very impressed at all, waitresses all had faces on them and food wasnt great. Ended up going downstairs for a few drinks and felt like I was in a totally different place, staff were really friendly and chatty and took time to make you feel welcome esp the wee barmaid, dont know her name but she looked like katie perry lol. So they turned our experience around. Wont be going to the restaurant again though. Drpped into my old regular watering hole after a 25 year interval living in the States. Food was great and the girl serving was very friendly and quick. Prices were decent also. Much changed but still a good experience. i lv the belview but it is rather expensive agree the manager is rude. The bar manager is very rude. I wouldn't go back there ever again!!! I have always found both the food and service at the Bellevue to be excellent. However they do need to get a lift installed for disabled people. My brother is disabled and although we were offered seats downstairs, (not much fun sitting on bar seats or in an empty function room) this means you are excluded from the main restaurant and treated as a second class citizen. The food awesome and service is 1st class also staff very friendly. Would go everyday if we could afford it. Food average and over priced. Service very poor and to the point of being rude. Had to ask repeatedly for another drink (tea) and felt as if asking for something for the baby put the staff out. Won't be back! Majik so it is. Mate. Here, tell ye wa, that place is a dump so it is big man. Seriously like, I had the pie and chips one night, I said no veg and extra chips, sure didn't they bring me veg!! Terrible altogether so it is mate. i think the bellevue has got really expensive they charge city centre prices for a bar restaurant on the antrim road i have been alot of times for different occasions and usually the food has been lovely,but the price of a steak in the bellevue is wild.and a bottle of wkd is £3.20 wats that all about you would think they would even do specials to draw people in there is a credit crunch on! can you tell me if they use instant potatoes or mix them with the real spuds. Last time I visited I thought they had that powdery taste . My guests gave me a hard time like this was not normal in restaurants and I know lots of places do. disgusting place, dirty plates and rough people. we came from balmoral on the way back from portrush, very uncomfortable place, i would honestly go to mcdonalds up the road!! i work there, the birds on the bar are great! I wonder if anyone can tell me if a couple of guys still play there at the weekends. They play Irish songs, with a couple of John Prine songs thrown in. They also play "Flower of Scotland". They used to play in Whites Tavern on Saturday afternoons. I'd love to see them again! I was in the Bellevue on Mothers Day myself, it was also my 40th wedding anniversary. I definately do not have any complaints, both the food and staff were excellent. My meal was fantastic and the day was made even more memorable by the pleasent waiting staff, who were obviously under alot of pressure. One bad experience there would not dissillusion a regular customer like myself, i can honestly say every time i have gone there to eat it has been glorious. I would go back if I was you. Give them a break as you know mother's day is usually madness wherever you end up going for a meal. It is the case at Christmas as I am sure you will know. Try going again for a meal sometime when it is less busy. Mother's Day cannot be treated as a normal day as all the restaurants are bunged. Good luck! Good food great atmosphere and lovely friendly staff. Don't believe everything you read here. Excellent value for money too - I always leave totally stuffed! Hi annon,I dont cook, my maid does it for me. Just had a glorious meal in the Bellevue last night. A new menu has been introduced and much to my husbands delight, the t-bone is back on. The meal was out of this world. Maybe you should give it a try, u might leave with your tail between your legs! hi wee betty, u ever ask yourself y the t-bone was taken off the menu, and u musnt b a very good cook if ur husband loves that omg and how often do u go? do u cook? To ANNON, dude learn to spell. Maybe your taste is as bad as your spelling, ever thought about that?? The food in the Bellevue Arms is excellent, the t bone is a favourite with my husband and we have been disappointed for several weeks as it hasnt been available due to a chance in their menu. Why didnt you complain on the night as i find the staff are always polite and helpful. Hopefully the enchiladas werent the only balls she got that night. went to the bellevue for a romantic meal with my girlfriend, the food took ages to come out ant my T-bone was revolting. It was soooo bad I could not eat it, even looking at it made me want to be sick, my partner had chicken enchalatas (cannot spell) and she could have used them as bouncy balls. The bill was over £60 for slob we both could not eat. We do not like complaining, however we left so much on our plates we some how assumed the staff might have asked us why we did not finish our very expensive meal. Well the did not, they simpley scooped our plates sayn - yas finshd wt tat, then rushed us out . crap and i went for a green castle curry after and a bottle of wine. I thought the Bellevue Arms was a great night out on Thursdays when they had the Dj a guy called Stuart. The staff were friendly and the food was great. Keep up the good work guys. Enjoyed Lunch at the Bellvue looking over the sea, lovley garlic potatoes and the chicken and stuffing was beautfiul and also well presented, staff freindly and nice environment. def go back. ask yourself,why the staff changed? because they needed to, i would never go back after my experience!!!! maybe you were at the zoo!! Are some of the past people who have posted comments sure they were actually in the bellevue arms? Maybe they went to the zoo?? Or are just very hard to please!! I eat in the bellevue religiously every week, the food is beautifully presented and it is excellent value for money. The service is excellent, the staff have changed recently and always try to accomodate the needs of the customer. It is understandable mishaps occuring when taking large orders. I would say some of the people that have left comments have never had the "pleasure" of dealing with the public. Enough said. the bellevue is great you couldnt beat it with a big stick!! Visited the Bellevue on saturday night and was worried having read a couple of the reviews below. They must have been unlucky, had a wonderful meal, very well priced and very yummy!!! Its the only place i have ever had mashed potatoes without lumps!!!!!!! Great value for money, will def be back! Poor service followed by food poisening - nuff said! I had the misfortune to go there on Mother's day and certainly won't be going again. My meal grew cold waiting for a serving of mash, the staff treated me as if I was a nuisance and the gentleman we addressed our complaint to, just shrugged his shoulders. If my Mom had not been there I would not have let the matter drop so easily. Also main entrance and stairs are really shabby and out of keeping with the rest of the pub and restaurant. I'm an Irish ex patriot living in Sydney Australia.I visit my family when I can and when I'm home it's an immediate visit down to the Bellevue for a fantastic meal. Always recommended to my aussie friends. i would recomend The Bellevue to anyone! the food is excellent with very generous portions... my compliments to the chef!! the service was also fantastic, every waitress was happy to assist which made the meal so much more enjoyable. we then proceded to sit in harrys bar and the service again was excellent. the bars decor was beautiful and was made to feel very welcome. the waiting staff in particular, but also the bar staff, the management and even the door men were so polite which made our night out that bit better. i would definatly recomend the bellevue to anyone and i cant wait to go back!! 20 of us went to the Bellevue for my mums birthday in December and the service wasnt very good at all. The food was nice but I though it was a bit over priced. The views were stunning. I would go back again to give it another chance. I am always a satisfied customer when i go to Bellevue. The food is fantastic, the service is absolutely excellent, couldnt complain about it! The staff are always smiling which gives the place a happy and enjoyable environment to be in. I would recommend anyone to go to the Bellevue. Have been to the bellevue a few times always nice. Unfortunately after goin back on sun the 17th sept i will not be going back. The service was a disgrace the waitress never listened to our order properly and therefore the wrong starters were brought which ended in the unprofessional manager telling us we would be paying for two starters,even though we didnt order the first one. His attitude was very degrading have never been treated this way in a restaurant before,will never be back. On arriving at the Bellevue Arms with my family for a special occasion I thought the restaurant was of good decor and quite spacious as we were accompanined by a child until I came across the service. I have never been treated so badly at an establishment ever. The waitress was unable to do her job of taking our order and after a half hour wait we were brought the wrong starter. When we asked for the starter we had ordered we were told we would have to pay for both. The maitre d' then approached the table and told us it would be added to the bill even though we did not get it and we would have to wait at least another 10 minutes for our meal. When we did order the meal we requested that the child's meal be brought out with the starters. After around 15 minutes we approached the maitre d' again and asked for the child's meal and we were told no it would be served with the main courses as requested which of course we hadn't. We expressed to the matre d' that we felt this was a very unprofessional approach and he told us he felt he had done nothing wrong and believed his waitress had taken the order down correctly and we had changed our minds about the order which did not happen. We told him we would be complaining and he was very rude and told us that he was glad and went on to give his name. We have used the Bellevue Arms on many occasions and have never came across such rude staff in particular a gentleman who is to overlook the running of a busy restaurant. I will not be recommending this to anyone in future, I will be putting this is writing to the manager and I will never be back!! I've been to the Bellevue Arms a few times and would certainly recommend it to others! the food is gorgeous(very generous with their portions you get loads!!!) and they have a great selection on their menu to choose from! The service is excellent and our dinner came within 10 minutes. staff were also very friendly and helpful! You can add your own review or edit the details of this page. Vote yourself, it only takes a second! What To Keep Up To Date? Why not follow us on Twitter @belfastbar?